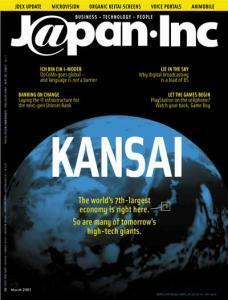 On the cover: Kansai's place in the world, at least geographically. Whew, we really went out of our way to get this shot. Why the keitai and the Game Boy are set for a showdown. A group of outspoken New Yorkers who happen to be Japanese, entrepreneurial, and looking for funding on both sides of the Pacific. And who have some strong opinions about the Net scene back home. We have reason to believe that many of Japan's hottest high-tech startups will come from this region, which includes Osaka, Kyoto, and Kobe. It's got the incubators, the universities and computer science students, and the networking communities. And a peculiar knack for online retailing. A new cellphone screen uses organic compounds to create amazing colors on a superthin screen. For an Osaka-based restaurant chain, serving sushi is just like clockwork. You'd think that the hyper-wired Net cafe so big in South Korea -- PC bangs -- would be huge in Japan, too. A young, unwired one tracks her i-mode usage for us. As i-mode goes international, offering non-Japanese content is a key challenge. Or is it? This wannabe journalist calls himself the world's smallest TV station -- he could be on to something. He's building an ultramodern IT infrastructure on a multimillion-dollar budget for one of Japan's newest financial institutions: Shinsei Bank. On the broadband boom, coupons via keitai, and Japan's Net ranking. Perceptions of the nation's agricultural self-sufficiency. Typing messages on tiny cellphone handsets is ... painful. We look at ventures racing to provide the best AI solutions for the Japanese language. Millions of Japanese can tell their cellphones what to do, thanks to Digital Media's voice recognition software. Next step: voice portals. CS and BS satellite, digital terrestrial and cable broadcasting -- is it all just a load of BS? e-Publishing Group, Animobile, ipTrend, and FORBiS. Last December we introduced our index for the New Economy in Japan. How's it performing so far? Satoko Moroi's new art piece uses voice recognition and a pool of water to send your words a floatin'. A clever way to make sure elderly relatives are OK: a hot-water pot that pings you online whenever it's used. How sweet -- and how Japanese.